Is the Duff Green Mansion Haunted? Standing in the center of the district of Vicksburg, the Duff Green Mansion is an impressive example of mid 19th century architecture. Originally built in 1856 by Duff Green as a wedding present for his bride Mary Lake, the mansion has centered its design around the entertainment of its guests. The couple were quite high up on the social ladder of the area and the mansion became known for lavish parties and the place to be seen if you were anyone, but this all changed in 1863. Union and confederate troops moved into the area during the civil war and the mansion was stuck right in the middle of where they met. The building was hit 5 times by cannon fire and in an attempt to save his home, Duff Green offered it up to the Union forces as a hospital. It housed wounded soldiers from both sides during this time, with union wounded on the top floor and confederate being cared for on the main, this continued up until Vicksburg was completely taken by Union forces on July 4th, 1863. After this it was leased to the U.S government as a soldiers home until 1866 when all the soldiers left. The Greens moved back in that same year and continued to live in peace until the death of Mr. Green in 1880. The house was sold later the same year and went through a number of different owners including the salvation army until the Sharp's bought it in 1985. A huge restoration took place under their ownership and the mansion was completely restored to its original glory. Today it is privately owned but is rented out for functions such as weddings and receptions. The mansion is thought to be haunted by many ghosts, with investigation groups agreeing the number to be no less than 10. 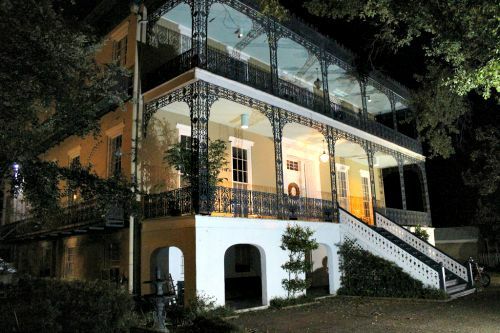 The most well known ghost at the mansion is thought to be the spirit of Mary Green, who seems to keep coming back here to check on the home she so dearly loved. People have reported seeing her apparition within all areas of the home, often being described as wearing a classy summer dress with long brown hair, and see is most often seen walking along a hallway or section of a room before gently fading away into nothing. The other ghost which seems to be continuously reported is that of a confederate soldier. Since many wounded soldiers on both sides would have been brought here to be treated, many of them would have died in the building. In the Dixie room the ghost of a confederate soldier has been seen sat in front of the fire place, missing one of his legs, though he has never been seen to turn around to face the shocked house guests. The other ghostly phenomenon often captured here is that of EVP. Strange sounds such as heavy furniture being dragged across the floor in rooms known to be empty, and strange ghostly whispers have been captured on many occasions. Below is a youtube video of a group who went into the mansion and recorded some interesting stuff.